NA » "PlayStation Coasters" Ha ha » ok... but what am I really looking at? 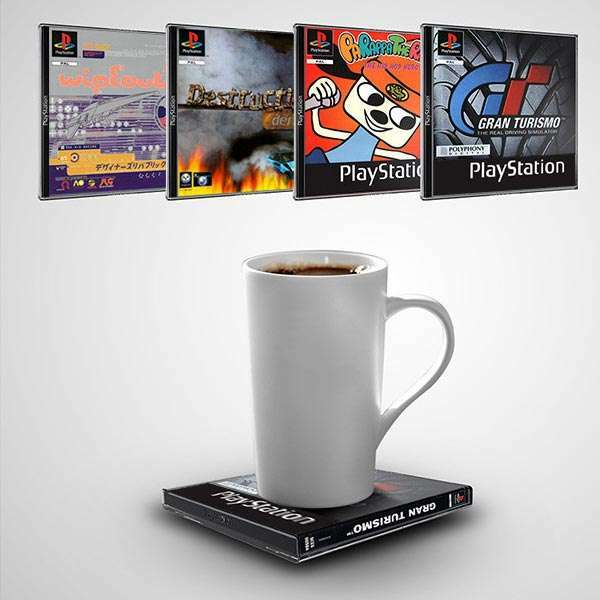 "PlayStation Coasters" Ha ha, ok... but what am I really looking at? At first I thought this was just a joke, but then I paid attention. This looks like a special CD case, but no like the PAL cases. Also, the cover says this is NTSC:U/C which is USA/Canada, and I've never seen a GTA cover like that, or a case shaped like this. So... anyone have any clue what this is? I opened the auction to point-and-laugh at "seller silliness" but now I'm really curious. I've never seen an item like this. Well, I'm an idiot and feel free to disregard. They are, in fact, coasters. I wouldn't call you an idiot for being confused by PAL style cases using NTSC artwork. I haven't seen those either, but they look pretty cool. Not cool enough for the money they are asking, but still pretty cool. Yeah, I agree. If I saw them in Target for about $5-7, I'd be tempted to buy them myself. My brother found some of these at GameStop a couple months ago. I think they were sold in a pack of 4 for maybe $20-$25. Each coaster was different. I'd buy em if you could swap out the cover art; that'd be pretty cool. I don't know what's real any more. You shouldn't feel bad for being confused by that product. It would be more ironic if the game art was an actual "game coaster", Bubsy, Micromachines etc. Force without justice is violence. Justice without force is useless. Now that I think about it, wouldn't a fake PS1 game DISC make a better coaster than a fake game case? Kinda odd that they used the Pal ones. Maybe they figured the NTSC ones would be too thin? I mean they're not even real cases or covers, so realistically they could have done anything they wanted. Oh, and none of that PAL crap. I'd want real NTSC U/C covers. Jeez, that'd be cool. I almost want to find these coasters in the wild to see if you can creatively extract the cover art and create your own. I sent a message to the person who has them on ebay; maybe they can tell one way or another. I almost want to find these coasters in the wild to see if you can creatively extract the cover art and create your own. Why don't you just make your own with cheap CD jewel cases with whatever kind of art you want on the inside? Take a second look-- they are smaller than CD cases, which is part of the personal appeal. I don't know why, but ever since I was a kid I've always been fascinated with miniatures of reall or semi-realistic things, so these are all the more desirable for that reason, if they are reasonably priced or what I'd specifically want. That's fine and all, but keep in mind that you could be making your own that are only slightly different for about a quarter a piece, or 50 cents max. Not just smaller, but specifically coaster sized. I think i'm going to start this business! Y'all go to that link and post up them coasters! "hi, yes is it possible"